A spaceship from planet VOCA just crashed to Earth, and the VOCA PEOPLE are making their entrance. They discovered that their spaceship’s fuel - musical energy - is running on empty. Their mission: to musically refuel their spaceship by performing the music of Earthlings. 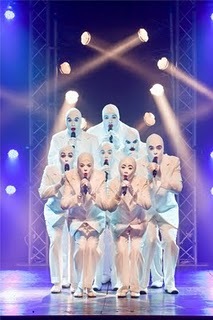 VOCA PEOPLE, (VocaPeopleNYC.com) created by Lior Kalfo and Shai Fishman, has landed at The Westside Theatre, (407 W. 43rd Street in NYC) and is produced by Doron Lida, Revital Kalfo, Leeorna Solomons, and Eva Price (Executive Producer). The show featuring an uber-talented cast combines vocal sounds, a capella singing, comedy and the art of beat box. Performed by eight snow-white ruby-lipped aliens with perfect harmony, there are no musical instruments, only vocals, and at times, it's hard to believe. They are that good! VOCA PEOPLE believe music is the source of life that brings harmony, joy and refueling. The 90 minute performance (without intermission) features over 70 well known songs that create vocal “fireworks.” VOCA PEOPLE is the musical theater event that bridges languages, cultures, and planets. It makes for a fun girls night out and is certainly suitable for families. I particularly enjoyed the rap performed by two of the male cast members. And, when they came into the audience to pick participants to join them, there were some good laughs, especially as they serenaded a gal who became the romantic muse of the male Voca People, and she was a good sport. VOCA PEOPLE has won intergalactic success with sold-out tours through Europe, South America, the Middle East, Mars and Uranus. Their videos have had over 20 million YouTube hits. Created by Lior Kalfo and Shai Fishman, VOCA PEOPLE is directed by Mr. Kalfo with musical direction and arrangements by Mr. Fishman. The show has lighting design by Roy Milo, sound design by Naor Ben Meir, and costume design by Doron Ashkenazi. Tickets for VOCA PEOPLE range from $25 - $79.50 with premium seating available. Visit http://www.vocapeoplenyc.com/. It is a unique show and worth checking out!